Circa 1895. 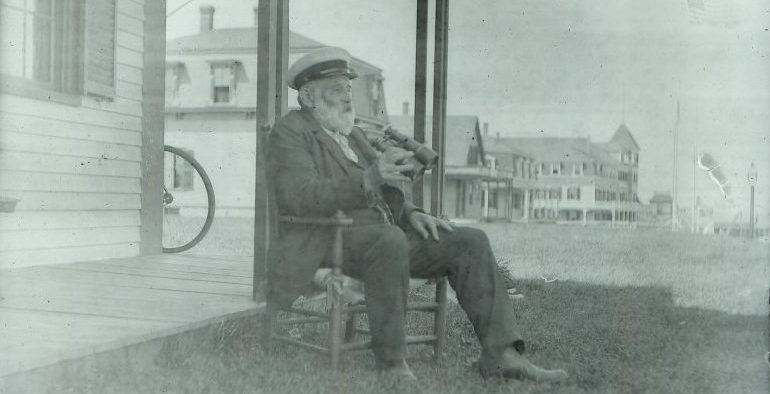 A sea captain looking out at the Atlantic Ocean with The Pryor House in the background. 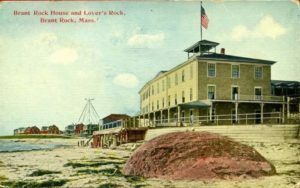 The village of Brant Rock, and The Pryor House are both very rich in history. Ocean Street, the road The Pryor House is on, was an ancient native American road, likely thousands of years old. While we do not have an exact build date of The Pryor House, the Marshfield Historical Society has placed it at circa 1870. It could be a bit older and it is one of the oldest homes in Brant Rock. Here’s a fun fact! If you visit historic Plymouth, MA, go and see the Massasoit statue. He is holding a pipe that was smoked during a historic peace treaty meeting with the Pilgrims in 1621. This original pipe was later found around the land that The Pryor House now sits on! You may be wondering what that radio tower is in the background. Well, the good news is that it is no longer standing. But, the tower marked a historical first. In January 1906, Reginald Fessenden achieved the first two-way transatlantic radiotelegraph transmission from this tower, exchanging Morse code messages between his stations in Brant Rock and Machrihanish, Scotland. Although the tower was dismantled, the insulated base still exists as a monument to the leap in technology that occurred at that site. 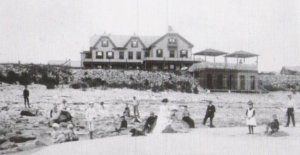 During the prohibition, boats used to land on the beach in front of the Pryor House and deliver contraband liquor to The Fairview Inn, which is about 5 houses down from The Pryor House. The contraband was delivered by way of a tunnel dug under Ocean Street from the beach to the hotel. The passageway is now covered by a rock wall that runs parallel to Ocean Street. Besides several additions, The Pryor House has not changed much from the 1870s. The original fieldstone fireplace and exposed beams are still in place. If you do a little investigating, it becomes evident which areas of the home were additions. The village of Brant Rock today is still a summer town. It is hidden away in Marshfield, bordering Duxbury. It is surrounded by water on three sides, making it known for its beaches. There is a mix of year-round and summer residents. The “downtown” section is lined with top dining establishments. The area is sought after for it views of the Atlantic and its closeness to the many beaches of Marshfield and Duxbury.